This rare hand colored map of the stars was engraved W. G. Evans of New York for Burritt's 1835 edition of the Atlas to Illustrate the Geography of the Heavens. It represents the Northern night sky in the months of January, February and March. Constellations are drawn in detail and include depictions of the Zodiacal figures the stars are said to represent. Included on this chart are Taurus (the Bull), Gemini (the Twins), Cancer (the Crab), Canis Major (the Greater Dog), Canis Minor (the Lesser Dog) and Orion. The chart is quartered by lines indicating the Solstitial and Equinoctial Colures. This map, like all of Burritt's charts, is based on the celestial cartographic work of Pardies and Doppelmayr. Dated and copyrighted: 'Entered according to Act of Congress in the year 1856 by F. J. Huntington in the Clerks Office of the District Court of the United States for the Southern District of New York.' This map was issued as plate no. 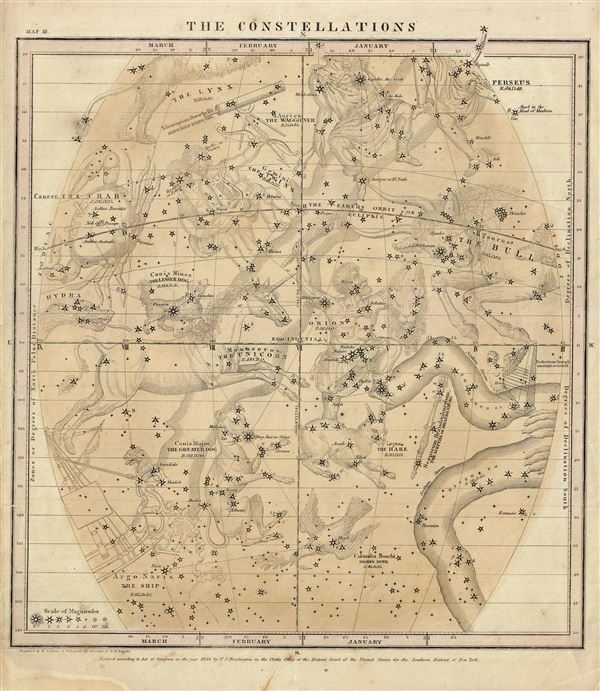 III in the Mason Brother's 1856 edition of Atlas, Designed to Illustrate Burritt's Geography of the Heavens. Brothers Mason, Atlas, Designed to Illustrate Burritt's Geography of the Heavens, New York, 1856. Very good. Minor age toning. Minor spotting at a couple of places. Blank on verso. Rumsey 2853.003 (1835 edition). Kanas, N., Star Maps, p. 277-78. Kidwell, Peggy Aldrich, Elijah Burritt and the 'Geography of the Heavens. ', Sky & Telescope 69 (Jan 1985).